Even as newer cellular technologies and standards emerge, many of the fundamental principles and the components of the cellular network remain the same. Presenting a simple yet comprehensive view of cellular communications technologies, Cellular Communications provides an end-to-end perspective of cellular operations, ranging from physical layer details to call set-up and from the radio network to the core network. 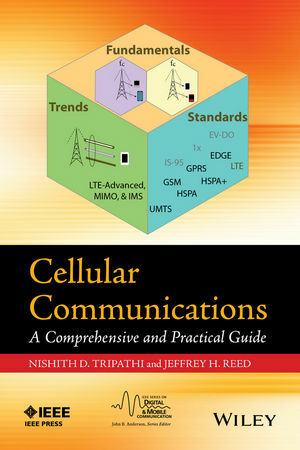 This self-contained source for practitioners and students represents a comprehensive survey of the fundamentals of cellular communications and the landscape of commercially deployed 2G and 3G technologies and provides a glimpse of emerging 4G technologies. Nishith Tripathi is a senior consultant at Award Solutions, Inc., a provider of technical consulting and specialized technical training for wireless communications. Dr. Tripathi has held several strategic positions in the wireless arena, for Nortel Networks and?Huawei Technologies. In 2001, he co-authored a book on Radio Resource Management, and he is the author of nine patent submissions and numerous research papers. ?His job functions at Award Solutions put him at the forefront of emerging technologies, enabling him to author/develop new technical training material for various technologies. Jeffrey H. Reed is the Willis G. Worcester Professor in the Bradley Department of Electrical and Computer Engineering at Virginia Tech. From June 2000 to June 2002, Dr. Reed served as Director of the Mobile and Portable Radio Research Group (MPRG). He currently serves as Director of the newly formed umbrella wireless organization Wireless @ Virginia Tech, one of the largest and most comprehensive university wireless research groups in the U.S.?Dr. Reed received the College of Engineering Award for Excellence in Research in 2001. Dr. Reed has served on several company advisory boards, including Samsung Electronics. He is cofounder of CRT Wireless, a company that is developing cognitive radio techniques for commercial and military wireless systems. He is a?Fellow of the IEEE for contributions to software radio and communications signal processing and for leadership in engineering education.